Dance and movement is relevant to many different subjects and contexts. From animated speeches and performances to participatory learning experiences, there are many possibilities for interactive presentations that can be customized to suit your organization or project. Dialogue by design, not default. Pre-conference interactive workshop for the Educational Developers Caucus Conference, (Re)Thinking Tradition, University of Guelph. Performing your Presentation: Using theatrical metaphors to engage listeners and communicate effectively. Interactive workshop for University of Guelph Learning Services 'Presentation Boot Camp' Program. Engagement is an Experience: Practicing Creative Facilitation Methods for Community Engagement. Active training session for The Research Shop Interns, University of Guelph. Dance Improvisation as a Science of Life: Experiments from the Studio. Presentation for the Canadian Science Writers Association Annual Conference, Guelph ON. Getting the A’s: Moving from Anxiety to Authenticity in Research. Interactive workshop for the Graduate Students KTT-KMb Learning Circle, University of Guelph. Freeing Frameworks: A Movement Improvisation Workshop. 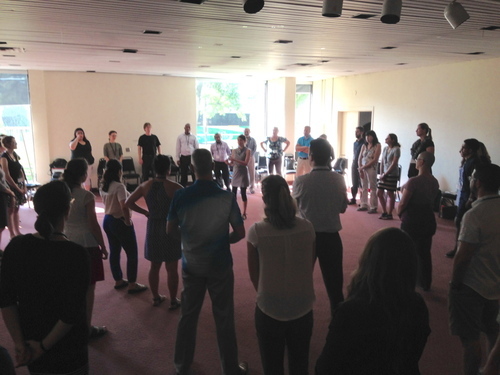 Active workshop for the International Institute for Critical Studies in Improvisation, University of Guelph. Moving Our Water Bodies. Participatory workshop for Groundswell: Conference on Groundwater, with Shared Value Solutions. A Moving Dialogue. Movement-based workshop for Thinking Spaces, with the International Institute for Critical Studies in Improvisation. When Bodies Speak Out. Lecture and workshop for 'Do So Much', Student Leadership Conference. Lost in Translation: bringing science to society through the arts. Lecture and workshop, with Dr. Melanie Wills. Moving Communities. Keynote lecture for Connecting the Dots, Dance Ontario Conference. Dialogue, decision-making and the role of the arts. Active workshop for the Rural Extension and Planning Graduate Class, with Dr. Wayne Caldwell and Dr. Jennifer Ball. Moving Media: investigating dance as a tool for environmental communication. Lecture, performance and dialogue for Sir Sandford Fleming College at the Royal Ontario Museum, Environmental Visual Communication Class. Community Relationships and Creativity. Lecture and active workshop for the Institute for Community Engaged Scholarship Interns, University of Guelph.